How is everyone doing? This month is going by so fast. I can't believe my birthday in next week Tuesday, May 15th and my graduation ceremony is that same week on Saturday, May 19th. For the past week, I have been looking forward to the Met Gala and finally it took place yesterday in New York. I wasn't disappointed at the styles & fashion. The Costume Institite gala is like the fashion industry's prom. I was so excited to see the risks and the gowns that you will assume that it was my prom. Some of my top picks from the Met Gala 2012 include Rihanna (minus the hair...I wish she could go back to short black hair), Gwyneth Paltrow, Emma Stone, Diane Kruger, Solange Knowles and Kate Bosworth. Who were your favorites from the Met Gala red carpet? Wishing you all a fabulous day! You ladies look fab!! love your skirt!! Oh, these collars! Fantastic! Brava! Love the skirt. Kisses and have a nice day. I get so excited every time you have a new outfit post!.. 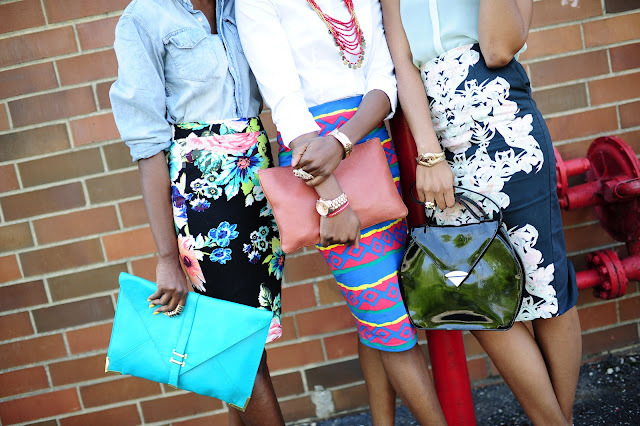 love love love the skirt...and michelle & Nife's 1 too..
Loving those pencil skirts! The prints are gorgeous! You ladies are just stunning! Chiming in with the others: I love your skirt! I wish you a very happy birthday and a joyous graduation. I graduate on the 19th as well. I can't wait for it to get here! You look wonderful, so did the other 2 ladies! My favorite was Solange, the yellow dress and her hair, FABULOUS!!! Beautiful pencil skirt and you look stunning like always! What a fabulous look! You all look gorgeous! Love all of your outfits, you have great style. wow you ladies are you fab!!! I love your skirt. Great pairing with the mint top. FAB look diva! This is fabulous! Love your skirts. Love the three outfits, they are amazing!! Like always, you look stunning, I love the accessories. Fantastic photographs you all look marvelous! Love your whole outfit!! Your sooooo beautiful!! I love your bag and skirt! You are all so cute and fashionable. I really need a T strap sandal soon. Beautiful outfit, really like the top. Congrats on your graduation. wowoww! you'll have a great week!!! Honey you look stunning!! Crazy in love with this outfit. PS. Just liked your Facebook page doll and I have a new one and would love for you to like it. Here's the link. Loved your whole look! You and your friends looked fabulous! Love your skirt and you and the ladies look amazing!! Wow! You look amazing! Love your skirt. In fact you all look amazing in your printed skirts. Thank you so much for passing by my blog. Hope to see you again soon. A birthday and graduation in the same week, so exciting. Congrats!!! You all look fab! Love your skirts!!! Forgot to say that I do agree with you on Rihanna's hair on the Met Gala, I mean, what was that?! Love the Peter Pan Collar on your shirt. wow what an amazing trio! you all look fabulous! what you are beautiful and stylish girls!